Videoslots' Battle of the Slots | Now Available on Mobile! 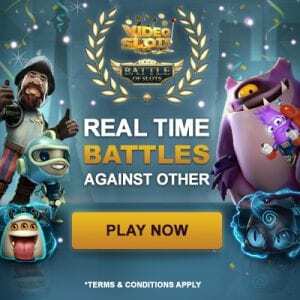 Videoslots’ Battle of the Slots – Now Available on Mobile! VideoSlots Casino have a feature-filled month this month, with updates to Battle of Slots, Tuesday Madness, Swish & New Testimonials! They have also been busy this month with loads of new games – and more importantly, new improvements and features launched. We will keep you guys updated on the latest info from Video Slots Casino, therefore, updating our Video Slots Casino Review page we have for you guys. They have now launched a new way of playing Battle of Slots, it is now for the first time available via mobile! Swish has also been launched for making the life of you Swedish depositors easier, while a brand new feature called Tuesday Madness and Battle Rounders also emerged. Swish is the biggest and fastest payment method in Sweden, and they have added this amongst their payment options. It is a transfer made with Bank ID and takes literally half a second. The moment we have been waiting for is here! You can finally play Battle of Slots on your mobile! As a result, you can bring your Battles wherever you go, I’m sure they have tried to achieve this since the launch of Battle of Slots in 2015. You can now play a new concept in Battle of Slots, which is a way of playing Sit & Go’s. This is called Rounders, which makes sure you can play multi-layered with 5 rounds that you can buy into. You can read more about these at Video Slots Casino. Every Tuesday, a Battle will take place, one with a prize pool of €15,000 to be won (at least)! But, for every €1 Buy-in to the Battle, will be added to the prize pool. This means that if another 1000 players do Buy-in, the prize pool will go up to €16,000. With all wins being wager free this is a fantastic promotion. Terms and Conditions do apply so please read them before you play. In March they have also launched a bunch of new game suppliers, these being Reflex Gaming, Imagina Gaming, Mutuel Play, Slingshot Studios, and BB Games. From these, and the rest, they have released a total of 45 games new games for you guys to play! If you have any thoughts on these changes, feel free to leave a comment below.